Returning from a long voyage more news about Grandfather. At the occasion of Remembrance Day 2014 I was invited as a guest speaker in a British Remembrance Day service. I had a day to think about what I should talk about and yes you are right I chose Grandfather's message and a further lead over to address the some 600 mainly British but also Canadian and Australian attendees. A friend videotaped the speech with his I-Phone, thus the quality. Thank you Egbert. That was very moving. I watched it with my son.. I have only made this post just to locate which forum the this thread has been posted to. Can still be viewed on the BBC website (although maybe not in all countries). Good memories of a great day with a good friend, telling a wonderful story. Thank you for mentioning your grandfather's burial place in Merville. That made me curious and thus I could find my way to this wonderful threat. Very moving – very fascinating. It reminded me about the sentence that stood in the letter to my great grandfather’s family that his belongings had been sent home. I will never know what these were, but definitely not such a treasure as you have shown here. Fantastic that the family and you kept it during all these years. Still so today. Thanks Neil - and Egbert. Thank you Christine and Trajan. I take it that the story of Gottfried still is not totally forgotten here on GWF and sometimes still finds its way to some interested in German aspects of the Great War. sometimes still finds its way to some interested in German aspects of the Great War. Well, what was in this mystery box that was opened (I suppose) 11 years ago? egbert. After a break from this site owing partially to our earthquakes here in Christchurch I am back. I too saw your Antiques Road Show appearance here in New Zealand late last year. You are famous and I took great pleasure telling anyone that would listen to me that I knew you. I think I may have given the impression that we were friends. Sorry about that.. Just my attempt to boost my ego. Anyhow I am so pleased you are world famous. Has anyone thought of asking Hughie Green? trully amazing story and great topic! Interests:1st/4th King's Shropshire Light Infantry. 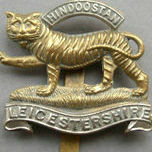 1st, 2/5th, 6th, 9th & 11th Leicestershire Regiment "Tigers"
The BEF on the western front. Wow, I am annoyed at myself for being so late to such an emotive thread. Thank you so much for sharing such a personal journey with us! Two weeks before the 100th day of death of my GF the annual battlefield excursion of the Dutch WW1 "Eerste Wereldoorlog Forum" lead them to the site where GF was kia and to the nearby cemetery in Merville where he is buried. Under the patronage of Jan, aka AOK4, they listened to some facets of the story that is told in this thread here. His stone is so clean - it looks freshly prepared and not 100 years old. It was changed in 2000 or so IIRC, before that it was a stone for an unknown German soldier (it is mentioned somewhere earlier in the thread). I have just read parts of the tread for the first time. What a wonderful and emotional story! Like you, one of my driving forces is to keep my ancestors memories alive, especially now I have discovered what they went through in that terrible (but fascinating) war. Our relatives may have been on opposing sides, but at least people of our generation can understand the incredible hardships and danger they went through and look back with total admiration for the ordinary soldiers ... regardless of what side they were on! Thank you for sharing Gottfried's story. God Rest all of their souls. I will be taking a long moment to remember Gottfried tomorrow at 9am US EST - and Else - and the children. Like others I have only discovered this remarkable and moving thread in the past couple of weeks. Thank you for bringing this story here (and for the 'reveals' ). Right now around this very minute 100 years ago my dear grandfather was killed in action. As long as i live you are not forgotten. I am far away on the 7 seas but whoever is nearby Merville please lay his favorite flower a white Chrysantenum flower on his grave or the very spot where he was killed. Followed this thread from day one, but apparently never had the courtesy of acknowledging your effort and kindness in sharing. But better late than never. Thank you, Egbert! I'll be happy to buy you a Bier of your choice, should we ever meet. Not forgotten by your friends either Egbert.